John Adams was President during the Quasi-War with France. On February 6, 1778, during the Revolutionary War, the United States and France entered into a Treaty of Alliance signed by Benjamin Franklin, the Comte de Vergennes and others. Also known as the Franco-American Alliance, it set up a military alliance between the two nations and aided the Americans in their cause against the British. In 1793, war between England and France broke out. A year later, John Jay negotiated a treaty with Great Britain that increased trade between the nations, resolved several points of contention between the nations and averted war. The French and Americans were already at odds over the United States’ refusal to continue paying its debt to France in the wake of the French Revolution. The Americans believed the debt was payable to the monarchy of France, not the Republic. While the Jay Treaty resolved issues with Britain, it created new tensions with France. On March 4, 1797, John Adams took office as President. Prior to the inauguration, Adams, a Federalist, wanted to send either Vice President Thomas Jefferson, a Republican, to negotiate with the French. Adams decided that it would be unwise to send the Vice President, as he was next in line for the Presidency. He then settled on a plan to send two men, Elbridge Gerry and James Madison, to join the U.S. Minister to France, Charles C. Pinckney in Europe and carry on the negotiations with the French. Unfortunately, the plan met with resistance from Washington, High Federalists and members of Adams’ cabinet. 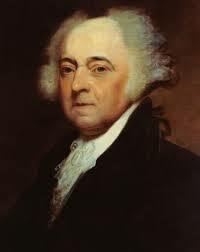 They found Madison unacceptable, but Adams told the cabinet that he would not be swayed by party politics. In response, Secretary of the Treasury Oliver Wolcott threatened to resign. Later, Jefferson informed Adams that Madison had refused the appointment. Between this and Adams’ failure, in Jefferson’s eyes, to stand up to the members of his party, a rift was created between the two Founding Fathers that would last for many years to come. Soon after, word came that Pinckney had been rejected by the French government. He left France, afraid that he would be arrested and went to the Netherlands. There he waited for instructions from the new President. Eventually, John Marshall was chosen in place of Madison to join Gerry and Pinckney. At the end of 1797, Adams addresses Congress, and made it clear that there was a need “to place our country in a suitable posture of defense.” Then in the Spring of 1798, he told Congress of the XYZ Affair. This involved the French Foreign Minister, Charles Maurice de Talleyrand, sending agents to meet with Pinckney, Gerry and Marshall. The agents made demands and set conditions for negotiation, which Pinckney flatly denied, saying “No, no, not a sixpence.” Marshall and Pinckney returned home, and the announcement of the Affair unleashed a wave of anti-French sentiment. This led to the passage of the Alien and Sedition Acts, a controversial set of four bills that were intended to keep foreigners living in the United States from having an influence on American opinions. As the slogan “Millions for defense, but not one cent for tribute” became the rallying cry of the Federalists, Congress commissioned 1,000 privateers to defend against French hostilities and established the United States Navy on April 30, 1798. By May, the sloop Ganges was guarding the coast between Long Island and Chesapeake and was joined the next month by the Constellation and the United States. On July 7, 1798, Congress rescinded all treaties with France. The same day, the USS Delaware captured the French privateer La Croyable off the shores of New Jersey. Two days later, Congress authorized American warships to attack French vessels. With a fleet of about 25 ships, the U.S. Navy patrolled the coast down through the Caribbean, looking for French ships. The most famous battles involved the frigate USS Constellation, a 38-gun ship commanded by Thomas Truxton. The first battle occurred on February 1, 1799, and involved the 36-gun French frigate L’Insurgente. The French attempted to board the Constellation, but Truxton was able to maneuver away and fire on the L’Insurgente, leading to the French surrender. Almost a year later, on February 2, 1800, Constellation engaged the 52-gun frigate La Vengeance. The Constellation pounded the French ship for five hours, but the French were able to escape under the cover of the night. In the entire conflict, the Americans only lost one ship, the USS Retaliation. The Retaliation was re-chistened La Croyable, which had been captured from the French in 1778. The ship was under the command of Lt. William Bainbridge and on patrol in the West Indies with the USS Montezuma and USS Norfolk. The Retaliation was overtaken by two French frigates, L’Insurgente and Volontaire, on November 20, 1798. Bainbridge found himself outgunned and surrendered. The following June, the Retaliation was recaptured by the USS Merrimack. In all, the new United States Navy captured 85 French vessels, and approximately 2,000 merchant vessels were lost. On November 9, 1799, Napoleon’s coup in France marked a change in the direction of French politics and policy. Soon after, word came to President Adams from William Vans Murray and John Quincy Adams that France wanted to negotiate. The President dispatched official envoys to France. On September 30, 1800, the Treaty of Mortefontaine was signed, ending the hostilities of the undeclared war. The Treaty terminated all previous agreements and reestablished trade ties between the two nations.